Workhorse to spin-off electric passenger helicopter drone » UAV DACH e.V. Mitgliedslogo im UAV DACH e.V. Chronik des UAV DACH e.V. UAS Büro des UAV DACH e.V. UAV DACH e.V. – Warum …? 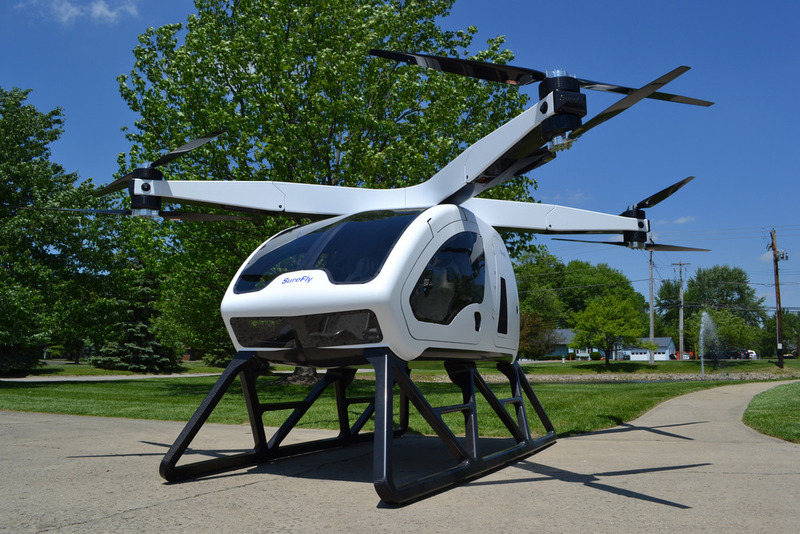 Attendees of this year’s Consumer Electronic Show held annually in Las Vegas, Nevada, will have the chance to witness the first experimental flight of the SureFlyTM electric hybrid helicopter. Resembling a quadcopter like design, the unit can fly with a 400-pound payload, including human passengers that someday could be flown autonomously and unmanned. The U.S. Federal Aviation Administration has provided a certification for the test flights. Developed and designed by Workhorse Group Inc., the SureFly can fly roughly 70 miles on a single charge. In December, the Ohio-based company announced intentions to spin off its SureFly business unit from its other sectors. In addition to its passenger-carrying electric-powered helicopter-like drone, the company has also designed cargo delivery vehicles and electric trucks. Steve Burns, CEO of Workhorse, said that while SureFly has been one of the company’s most exciting products it has ever built, the move to separate the company from its other focus areas will help facilitate long-term growth for all. Once the transaction of the spin-off is complete, Workhorse will use the added capital from the team that is buying out the business to enhance its work on its core automotive business. Through the deal, SureFly Inc. will retain the aerial technology and expertise including the helicopter related property. The HorseFly drone, a delivery drone designed by Workhorse, will not be included in the deal but a royalty-free, perpetual license to use the HorseFly drone except for deliveries from a ground-based vehicle will be granted. According to Workhorse, the company has entered into a note purchase agreement with a group of existing, U.S.-based investors. Under the terms, the company said, Workhorse will issue notes with an aggregate principal amount of $5.75 million at a purchase price equal to $5 million. Beitrag im Original auf http://theuasmagazine.com/articles/1798/workhorse-to-spin-off-electric-passenger-helicopter-drone, mit freundlicher Genehmigung von The UAS Magazine automatisch importiert, Original in englischer Sprache. RSS-Feed von UAV DACH e.V. Alle News Kategorien im UAV DACH e.V.